Getting There: Paris is the closest international gateway to the Loire Valley. Depending on your U.S. departure city, airlines serving the two airports of Paris, Charles de Gaulle and Orly, are: American, Air France, British Airways, Continental, Delta, Lufthansa, Scandanavian, Swissair, TWA, and United. Web links are listed in this magazines Airlines page. The quickest connection to the Loire is by theTGV, a 45-minute trip from the Roissy Station in Paris to Tours. If you drive, we recommend you rent a car from the United States before traveling. Most major car rental agencies service both Orly and Charles de Gaulle airports. The 1-800 phone numbers and Web links are listed in this magazines Autos page. Staying There: There are a variety of hotel and B & B (chambres d'hotes) establishments in the Loire Valley. Tours is the biggest city in the Loire Valley with the greatest number of rooms. Orleans and Blois are also fairly large towns. An excellent resource for lodging and exploring in the Loire Valley is Rick Steves' France, available through the amazon.com ad link below. His book provides advice for those traveling by either car or train. When visiting the chateaus, remember that the normal visiting hours are 9 a.m. to 6 p.m. and most close for lunch, 12:00 p.m. to 2:00 p.m. You can rent bicycles in one of the towns and peddle in comfort on the relatively flat roadways. If you plan to picnic, you can pick up your groceries on your way to the chateau. It's recommended to pace your chateau-viewing to one or two chateaus per day. Photo courtesy: Chateau de la Barre We recommend staying in a B & B in the country and having your own auto transportation in order to best experience the Loire Valley's beauty. 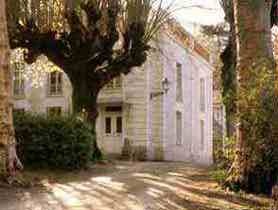 Chatea de la Barre is an excellent country B & B, 8 km (5 mi.) 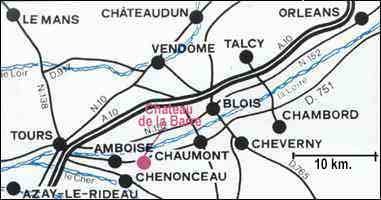 east of the village of Amboise and close to some of the most renown chateaus, as indicated on the map above. All rooms have private bath. We encountered prices in the range of $100-$125 per day. Michel Marliere, the proprietor and chef, offers exceptional regional cuisine dinners at a good price (optional). Telephone: 02 47 57 49 23. Fax: 0247 57 49 23. To dial France from the United States, first dial 01 for international access, 33 for France, then dial the number. There is a 9-hour time difference. Address: Chateau de la Barre, Mosnes - 37530 Amboise. Fast Facts: The Loire River is France's longest, at over 600 miles. The region commonly referred to as the Loire Valley comprises approximately 100 miles of the river's most fertile land between Anger to the west and Orleans to the east. The river was historically a primary means of transportation, but today the sandy river is not maintained for motored boat navigation. The Loire Valley was the the site of major warfare between England and France during the Middle Ages and the Hundred Years War (1337-1453). The Loire Valley's golden age started under king Francois I in the 15th century. He hired Renaissance craftsmen from Italy, including Leonardo da Vinci, in constructing and furnishing grand castles. France's power base resided here until around 1600. Even when the aristrocracy moved to the Paris region, many aristocrats continued to build chateaus along the Loire until the French Revolution. Today's Loire Valley still has hundreds of restored and maintained chateaus from its historical past. 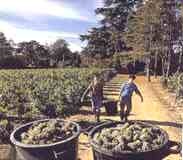 It is also known as the "Garden of France," with renown wines, cheeses, fruits, vegetables, and cuisine.